If you are planning a swimming pool renovation project then you might be interested in some ideas for different features that you can add to your pool. 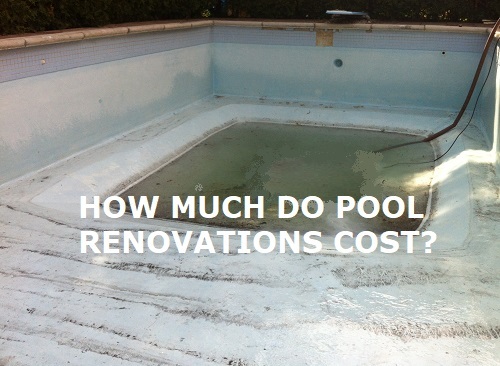 This article is intended to help you to understand some of the more expensive swimming pool renovation costs. Not specifically the very most expensive, but the upgrades that pool owners request often only to be floored when finding out how much it will actually cost. There are a few common pool renovation ideas that consistently put the pool owner into "sticker shock" over the price for the renovation being much higher than expected. 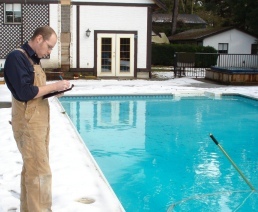 Usually the disconnect is simply that pool owners do not fully appreciate the technical process used in building and renovating swimming pools. In the end, what is important is value as optional upgrades to your pool are just too expensive to "have it all". Hopefully in this article pool owners can learn a little more about why some common pool renovations costs so much money so they can plan ahead and set aside extra savings if any of these renovation upgrades are on your list of must have items. Pricing for swimming pool components and contractors varies drastically depending on where you are located. It is not practical to include in this article specific pricing for what you should expect to pay in your area for these services. Instead, by understanding how much work is involved with each of these renovation items, you might be able to appreciate the higher cost for the estimate from your contractor. Also, by understanding more about how these renovation projects come together from a technical perspective you will also be better armed to understand how an estimate from one contractor can be so much lower than another contractor...almost always this can be boiled down to a difference in the technical process being used. If you are interested in learning more about how price estimates for pool work can vary so dramatically you can read this article on lowball pool quotes. This first renovation example provides a good comparison for how a different technical process can result in a lower price from one contractor versus other more expensive quotes for the same job. When you look at just how many steps are involved with something like installing in-wall stairs you can start to appreciate the ways that someone could cut a corner to save a few dollars. For example, as described below, concrete is used to hold in-wall steps in place...so how much concrete is going to be used to hold your new steps in place? A good contractor will spend more for concrete materials and use more under your steps where a cheaper contractor will use the bare minimum amount. You will not likely know the difference until five or ten years later when your steps start to crack or shift. Vinyl liner pools used to have far fewer options available than the common era vinyl liner pools. Most commonly the pool was built big, and deep, and would include deck items such as diving boards and slides. During this era, it would be common to find either one or two stainless ladders as the entry / exit points for the pool. Older generation vinyl pools very rarely had in-wall steps. In the past 20 years the acrylic and fiberglass in-wall steps have become much more popular and virtually every vinyl pool built today has steps included in the design. If you own an older vinyl liner pool and have not yet renovated it to add steps for easy access to the pool then this surely will be something that you want to look at when the time comes to renovate your pool next. Most commonly pool owners tend to try to schedule major renovations to coincide with the pool liner needing to be replaced. The problem usually comes when pool owners find out that adding in-wall steps to a vinyl pool costs more than the new liner is going to cost. From the perspective of the pool owner it can be confusing as to why adding stairs to the pool needs to cost so much, but once you start to break down the process it becomes clearer. Step Costs - First you must consider that the step itself is very expensive. Usually a thousand dollars or so for entry level steps, up to a few thousand dollars depending on the style, size and color that you are looking at. These step sets are huge, heavy and awkward to move. If there is not machinery available on the site for lifting then a team of people will need to kill themselves getting the steps off the truck and into the backyard next to the pool. All of this is just to get some steps on site. Deck Removal - The pool deck needs to be cut and jackhammered out to accommodate the footprint from the new steps. Very often the entire pool deck (and coping) are also removed and replaced during a vinyl pool renovation that includes adding in-wall steps. Digging Out The Steps - Pool steps are often six feet or eight feet long and about four feet deep and wide, depending on how much overdig the contractor prefers to have. This is equal to almost 130 square feet of material to be dug, moved, and mostly removed from the property. Breaking Footer Collar - Once the bottom of the pool wall has been exposed the concrete collar that holds the bottom of the wall in place around the perimeter of the pool needs to be cut and broken out to expose the wall panel seams. Wall Section Removal - A section of the wall panels must be removed in order to make space within the wall for the new steps. This involves removing bolts and cutting steel supports as needed. Once all of the supporting bolts have been removed and the concrete footer broken out then the wall section can be removed from the pool. The old wall panel is large, and heavy, and will need to be transported to a dump or metal recycling facility. Step Installation - The new steps are fitted in place and the side flanges are installed to fit the existing pool wall flanges. The steps are supported with PVC legs from the underside that need to be carefully set for height and plumb. The steps are then backfilled with concrete to help hold the PVC leg supports in place and provide support to the front edge and prevent the steps from shifting or moving. Backfill & Finish Deck - The remainder of the hole for the steps needs to be backfilled and compacted before repairing or replacing the deck area around the steps. If the steps that you chose have jets installed then this work also needs to be competed. In some cases this might mean interrupting a buried return line that is adjacent, but more commonly this would include running a dedicated step jet plumbing line from the stair location to the equipment pad, and then adapting the step jets into the return manifold plumbing. By the time you see all of the steps laid out in order you can really start to appreciate how the cost for these adds up quickly. By comparison, changing a vinyl liner in a pool is much faster, much more straight forward and with vastly less physical effort required. I would rather change three or five liners as opposed to installing one set of in-wall steps. It is the difficulty of installing steps, as well as the price, which has lead to covered vinyl steps growing in popularity in recent years. Vinyl over steel (or vinyl over polymer) is a covered vinyl step system where steps are added inside the perimeter of the pool (as opposed to in-wall steps which extend outside of the pool perimeter). This process eliminates most of the heavy lifting of installing pool steps, so to speak, in that the deck does not need to be altered and you do not need to dig out the step area. With covered vinyl steps you purchase and install step (and bench) structures into the pool interior. The liner installation process for covered vinyl steps is much different, and more difficult, than a traditional liner installation. Depending on the complexity of your step design you may require a vinyl welder to custom fit your pool liner right in your backyard. This can cause extra costs for the liner installation and also slow down your installation schedule during busy times of years since vinyl welders are very uncommon in some areas. The less difficult covered vinyl step styles do not always need the vinyl to be custom fit on site. Careful measuring and ordering of the liner can result in reliably good looking installations, with only very minimal chance for small wrinkles in the vinyl around the steps. Despite all of these extra steps and concerns, covered vinyl steps are still much less expensive than in-wall steps...however both are a considerable pool upgrade and often more money than pool owners are initially expecting these renovations to cost. Modern era swimming pools not only have lights, in most areas new pools are required to have lights as part of the minimum safety requirements for the pool. Older swimming pools did not require lights. Older pools used lights as an optional item which could be added so many pools were built with no lighting at all. This leaves a lot of swimming pool owners looking to add lights to their pool during a scheduled renovation - usually when the interior surface needs to be completed. With a vinyl pool this would be when the liner needs to be replaced, and with a concrete pool this would be when the interior surface needs to be refinished. Since lights in a pool are a great feature to have, and adds the safety benefit for swimming at night so the bottom and ledges of the pool are illuminated, it is little wonder why pool owners so often inquire about adding them. Adding lights to an existing swimming pool is one of those renovation items that pool owners are consistently surprised by the costs. Sure it can not be easy to install lights on an existing pool, but how much could it possibly cost? Well, quite a bit actually. When you consider the cost of the lights as well as how many steps there are in the installation of the lights you can start to see how the costs add up. This is especially true for traditional niche style lights, which have additional bonding concerns that the newer plastic niche, or nicheless style lights do not have. Lighting Costs - First, the cost of pool lights is probably much more than you are anticipating right off the bat. Pool lights are very expensive for what they are. If you want bigger, brighter lights, perhaps with color changing options, then these lights can cost many hundreds of dollars...just for the bulb! This does not even factor in the cost of the niche, deck box, transformer, control box etc. Open Pool Deck - In the area where the light will be located the pool deck will need to be opened and dug down at minimum a few feet. The light will also need to have electrical conduit run to it so the deck may need to be removed more to allow for the conduit run. Circuit Control - In addition to running a power conduit to the light location in the pool, you will likely also need to run electrical wires to a convenient switch location for you to turn the pool lights on and off. Commonly this would be to a switch location on the doorway access from the house to the pool area. Alternatively the lighting system can be tied into an automation system to control the lighting function remotely. This is becoming a much more common option as automation systems for pools continue to improve. Electrical Bonding - The power circuit is only one of the electrical concerns for installing a new light. The bonding grid that was installed around the pool needs to be located and brought over to the light location. In the event the bonding grid can not be located local to the light, it will need to be picked up where it originates in the main house electrical panel and run to the pool location. Installing The Light - In a vinyl liner (or fiberglass) pool the light installation is done by marking the wall and cutting out a templated size hole. The light is fit with a compression flange and gasket system, and the electrical and bonding are connected. In the event of a concrete pool, the area where the light will be located needs to be jackhammered out, and all the way through the pool wall. When the new niche is patched into the wall with concrete there will be a significant chance for water to leak from this area of the pool. A concrete pool retrofit in-wall light is harder install leak free than a vinyl pool (or fiberglass pool) light. 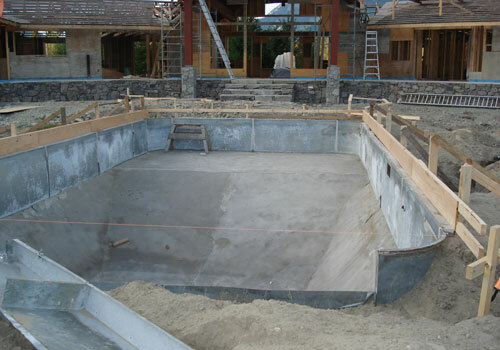 Patching The Pool Deck - After the light has been fully installed, the hole will need to be carefully backfilled. If the pool deck was cut in order to accommodate the light installation then it will need to have supports drilled into the adjacent concrete, and re-patched. 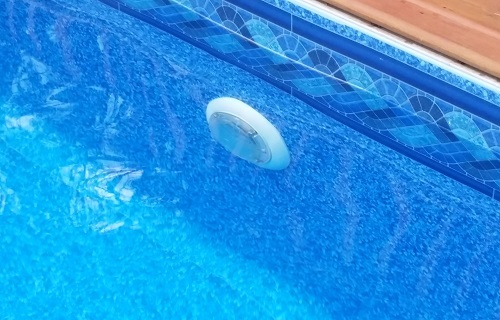 The aftermarket for adding lights to swimming pools is starting to improve in recent years. One of the improvements involves light niche's that are made completely of non-metal products. This would allow the niche to be installed without bonding, for example. There have also been improvements with light styles that are available, such as with these S.R. Smith LED lights . Since these are much smaller you are able to core holes through the concrete wall instead of jackhammering for a larger niche installation. This allows for a much neater and less invasive aftermarket light installation on concrete pools. With each additional day of work, or return trip that a contractor needs to make to your house, the costs of the renovation go up. The same is also true for any additional trades that will need to be brought in to complete the project. In the case of aftermarket pool lights this would usually involve an electrician as well as multiple days / return trips to the job site in order to install a new pool light. This is why a new light installed on an existing pool can cost many thousands of dollars once you factor in all of the smaller costs that add up. Most pool owners are surprised by just how much new lights can cost, and this in turn is why the smaller LED nicheless lights are much more popular for existing pools as they require far less work to install than a traditional niche style light. Changing the shape of a swimming pool is a fairly common question that is asked of pool contractors. The logic is that if a major pool renovation is planned, then how much extra work would it be to change the shape of the pool at the same time? The answer, which surprises most pool owners, is it would cost the same as building an entirely new swimming pool...plus the cost of removing the pool that you currently have. The same can be said for pool owners asking about converting from one kind of pool to another. This is a common question that I answered in this article about what is involved with converting a vinyl pool to a concrete pool. Even if you keep the pool type the same, and just want to change the shape, this requires extensive work...and extensive costs. Of course not all swimming pools and back yards are the same so every installation will be unique. For most properties, especially in urban areas, access to the pool area for large equipment is limited. If you want to do a major pool renovation you might be able to get by with smaller equipment. If you want to completely redesign the shape of your pool then you might require larger equipment access. Without the ability to get a backhoe next to the pool you may find costs for major changes to the hardscape to be prohibitive, or at least appreciable. 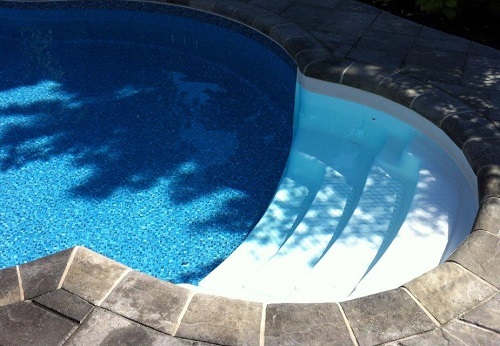 In the case of fiberglass pools there simply is no option to change the shape of the pool. Vinyl Liner Pools - Changing the shape of a vinyl liner pool involves digging up the original pool down to the concrete collar at the bottom of the walls. not all vinyl pools are built the exact same way, however many have segmented walls such that you can purchase additional wall panels (or an entire wall kit) and change the existing shape of the pool. This process, when done correctly, involves work to every part of the pool system from the plumbing, to the walls, to the collar, the deck, the pool floor, the coping, and finally a new liner. As you can see, if you plan to change the shape of your pool when you need a new liner, you do not actually save much, if anything, on the cost of the renovation. The work to change the shape of a vinyl pool is almost as much, if not more sometimes, than building a brand new pool would be. Most builders are efficient with new vinyl pool builds and they come together quickly. A very involved renovation like this can be very time consuming, and to a pool owner that means expensive. Concrete Pools - Changing the shape of a concrete pool shell carries a fair amount of risk. Concrete pools get their strength from their monolithic design, and changing the shape of the shell carries the risk of introducing cold joints in the concrete. Cold joints, where new concrete is added to old concrete, are a potential crack and leak location for concrete pools and typically something that you want to avoid. Shotcrete in particular is well suited for adding new-to-old since the velocity that the concrete is applied creates a sandblasting effect of the original surface, and can potentially adhere new concrete to old concrete such that no cold joint is detectable, even under laboratory testing conditions. So long as the surface is cut at a 45 degree angle, is clean and free of loose debris, you can add new shotcrete to old shotcrete without creating a cold joint. Cast concrete pools require bonding agents to attempt to mitigate cold joints, where shot pools do not require a bonding agent between layers. Regardless, the risks of changing the shape of a concrete pool are appreciable, as are the costs given the scope of hardscaping, steel working, plumbing, concrete, coping, tile and interior surface that are needed to complete the job. Much like vinyl pools, changing the shape of a concrete pool can cost as much as, and sometimes more, than what it would cost to have a new pool installed on a "blank slate" property. When changing the shape of a swimming pool almost every part of the pool needs to be changed, or at the least, modified. Even though you might have plans to renovate your pool, such as with a new coping and liner, or new tile and plaster, these renovations are isolated to the interior surface. Changing the shape of your pool requires changes to the shell structure of the pool itself, which is a totally different animal than dealing with the interior surface. Any time you are looking to add to or change the shell of a pool you can count on it being expensive. If you have a concrete pool you might like to look into what your options are when it comes time to renovate the interior surface of your pool. Unlike a vinyl liner pool, concrete pools have a host of options available in terms of interior surface coatings. It is very common for concrete pool owners to ask about upgrading to a different interior surface however most pool owners are surprised by just how expensive some of these upgrades can be. Concrete pool interior surfaces are usually a dense mortar worked to a smooth, highly water resistant finish. White sand and white cement would represent the most basic pool plaster composition however modern day concrete pools have far more options available. In addition to different systems, such as painting, fiberglass or epoxy finishes, there are multiple proprietary pool plaster masonry mixes designed as concrete pool interior surface products. While these pool finishes all have unique and expensive sounding names, they are all essentially sand and cement, plus the addition of colors or special colored aggregates in place of some of the sand. Colored Aggregate Plasters - If you were to look at the cost upgrade from white pool plaster to a more expensive colored finish you might be surprised at just how much more the color plaster costs. This is not true for all color plasters, as there are many different types and styles, but if your plaster requires special colored aggregates then this can end up costing you a bundle of extra money. To plaster a regular sized residential pool you might use three pallets of concrete materials - two skids of sand bags, and one skid of portland cement bags. If you were to upgrade to a colored aggregate then you might need an entire skid of quartz aggregate. White pool sand suitable for pool plaster could cost $20 per bag, which will be over 100lbs of sand. Colored crystal aggregate could be $50 per bag, and the bags are only 50lbs instead of 100. This means that the cost for 25 bags of the white sand might be $500, but to get the sand volume of colored aggregate might cost as much as $3000. In addition to the actual material costs, colored plaster products take longer to prepare for and install, as well as requiring an after-plaster acid washing and startup process that white plaster pools do not require. Pool owners often expect the cost difference from plain white plaster to a color option to be something like $4500 instead of $4000 where in reality it is more like $7000, or more, instead of $4000. Tinted color plasters are vastly less expensive than colored aggregate plaster options however they only have limited color options and you need to be able to live with the potentially uneven-ness of the finished coloring. 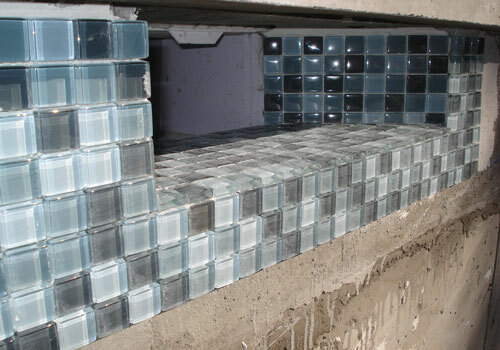 Glass Tile Upgrades - Similar to plain pool plaster versus some colored aggregate plaster finishes, concrete pool owners are often surprised by the cost increase if they would like to make a statement with the tiles in their pool. The cost of tile patterns such as mosaics, or high quality materials like some natural stones or glass tiles can be prohibitive to the average pool owner. A 20'x40' concrete pool might require about 120 linear feet of tile area, so for a one foot tile band that would be 120 square feet of tile needed. At $5.00 per square foot, for a basic ceramic or porcelain tile option, this would bring the tile cost to around $600 or so, as a working example. Offshore glass tiles might be $12 per square foot which would bump this cost up to $1440, and if you want American made glass tile it could up to $25 per square foot which takes your $600 base tile cost and pushes it to $3000. This is how a $5000 tile estimate can quickly climb to $10,000 or more which leaves many pool owners wondering where the money is going. The answer...to tiles. Tiles are expensive. Now just imagine how much the upgrade costs would be if you wanted to tile the entire interior surface of the pool, at over 1200 square feet! Adding a heater to your pool is one of those upgrade items that tends to cost more than most pool owners are initially expecting. The reason for this starts with the fact that there are a lot of moving parts and different trades people that need to coordinate in order to install a heater. Add to this the fact that (hopefully) heaters are one of those things that you should not cut corners when installing. 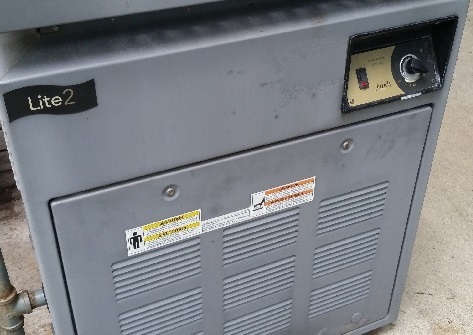 The average pool owner may take it upon themselves to install a new pool pump when their old one dies...very few are intrepid enough to attempt to install their own gas heater, and this is a good thing. As discussed in this article on how to make your pool more energy efficient, heating a pool is expensive no matter which way you choose to do it, but using a pool cover can help a great deal. It simply requires a huge amount of energy in order to keep this amount of water at a higher temperature than the ambient air temperature. This is especially true for colder climate areas as well as places where is gets chilly at night throughout the swimming season. When you are a child, you would swim in virtually any temperature of water. As you get older, the temperature that the water needs to be in order to be inviting goes up quickly. For this reason pool contractors often receive requests from pool owners for new heating systems and in many of these cases the pool owners are surprised to learn just how expensive it can be. Gas Heaters - Gas heaters, either natural gas or propane, are the gold standard for heating swimming pool and spa water...if you can afford it. The heater itself will cost $1000 to $3000 and installation will require a gas fitter, an electrician and a pool plumber as well as multiple site visits before you will be swimming in warm water. All of these trades, as well as the return trips, can add up quickly for the pool owner. An efficient pool company that does gasfitting, electrical and plumbing all in-house has a decided advantage when selling and installing heaters versus a pool company that outsources these components, or requires the pool owner to contract these people independently. Solar Heaters - Solar heaters are relatively cheap to buy and essentially free to run other than the increased flow resistance which you will pay for in an incremental increase in electrical demand for your pump. While solar heaters are the least impressive pool heaters in terms out output BTU value, the appeal of using energy from the sun as a free long term heat source can be very appealing to a pool owner. The surprise for pool owners requesting a quote on a solar heater is just how many solar panels it will take in order to meet even the most modest of heat expectations. In general you want at minimum to have half of the square foot surface of the pool in solar panels. For a 20'x40' pool this means, at minimum, 400 square feet of solar collectors. Electric Heat Pumps - Swimming pool owners very often ask about electric heat pumps as a potentially lower cost heat source for their pool. As I wrote about in this article on electric pool heat pump reviews, the potential for you to use a heat pump will depend on where you are located geographically as well as your expectations for heat. Even if you are in an area where a heat pump can be beneficial and efficient, heat pumps themselves are one of the single most expensive pieces of pool equipment that you can buy - far more than a gas heater for example. In addition to this, electric heat pumps for pools require a very robust electrical service, potentially 60A or more, which is expensive to install. Given the size of the electrical draw for an electric heat pump many pool owners would need to also pay for a substantial electrical panel upgrade to their home just to have the amperage load available in their panel. In a best case scenario an electric heat pump can be expensive to install. In a worst case scenario it can be completely cost restrictive. Swimming pools are expensive even under optimal conditions. When it comes time to renovate your pool as part of your regular maintenance it only makes sense to ask about various upgrades that you would like your pool to have. The upgrades listed above are some of the worst offenders when it comes to giving pool owners sticker shock over the price. On the opposite end of the spectrum there is a pool product that is often over-valued by pool owners - salt water. Many pool owners want salt water and often ask about whether a certain product is compatible with salt water. In 99% of cases, excluding heaters, salt water makes no difference at all. Take for example the subject of pool pumps. Pool owners often ask whether a pool pump is suitable for use in a salt pool...when in reality every pump can be used with salt water. I can not think of one to name which is not able to be used with salt...it makes no difference to the pump. A salt water chlorinator, or electronic chlorine generator, is a bolt-on device that can be installed on most pools in only a few minutes time. Simply adapt the salt cell into the plumbing and add salt to the pool. Salt systems are a great example of an upgrade that has huge value to some pool owners, when in actuality it is a relatively inexpensive item that is easily adapted and installed on most pool systems. If you want to read more of my strong opinions on salt water in swimming pools then you should start with this article that asks is salt water bad for pools?